The suit was the most important part. My mother in law helped with the sewing, and drafted the pattern to help us out. What a beast that was! Putting lining in a small sports coat was no easy task!! We left the bottom of the pants zig zag cut instead of hemming them to give that rough look. The pants also had elastic at the waist just in case they didn’t fit just right. For the shirt and tie, we used material that had been left over and we had laying around! 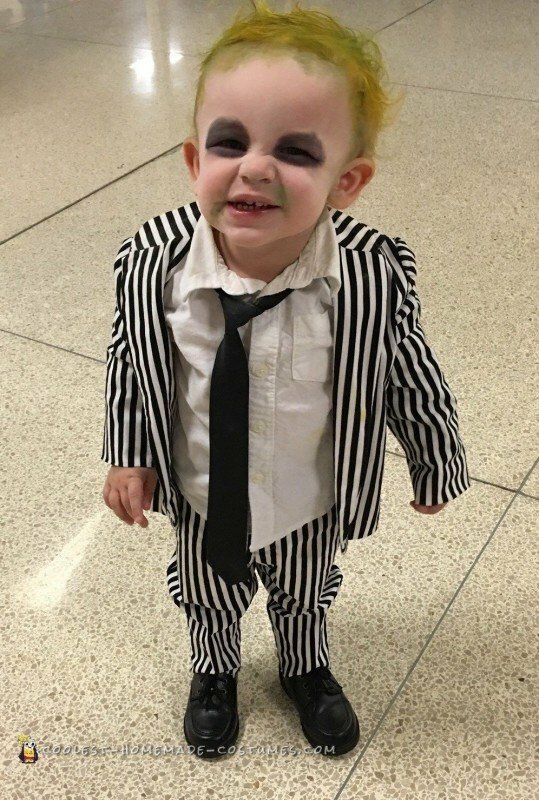 Our baby Beetlejuice costume really came together. How perfect!! We practiced Fisher’s makeup 3 times before the big day for him to get used to having it on. I love how the white came out. I found a little secret to putting the white makeup on. Dip an egg sponge in moisturizer first! This worked best to make it less streaky. From there we set the white makeup with baby powder. The eyeshadow we mixed both purple and black and also applied with a sponge. 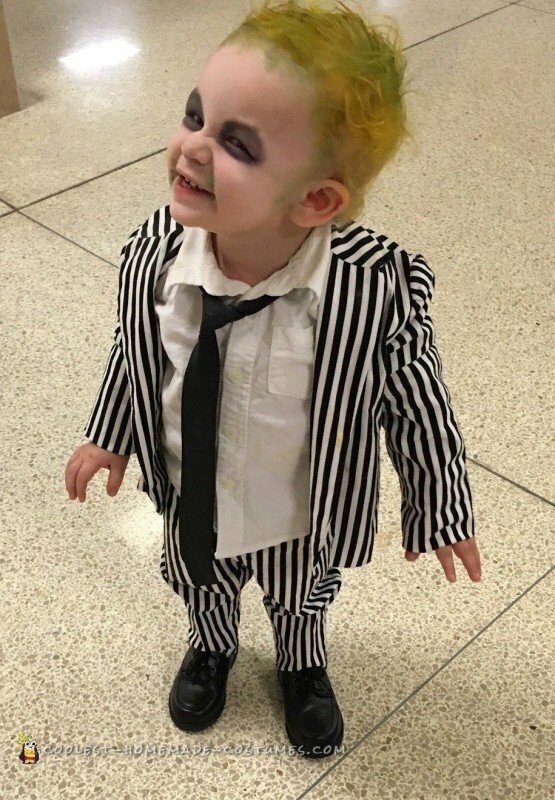 I looked at a pic of Beetlejuice and eyeballed where to place the green at the very end. 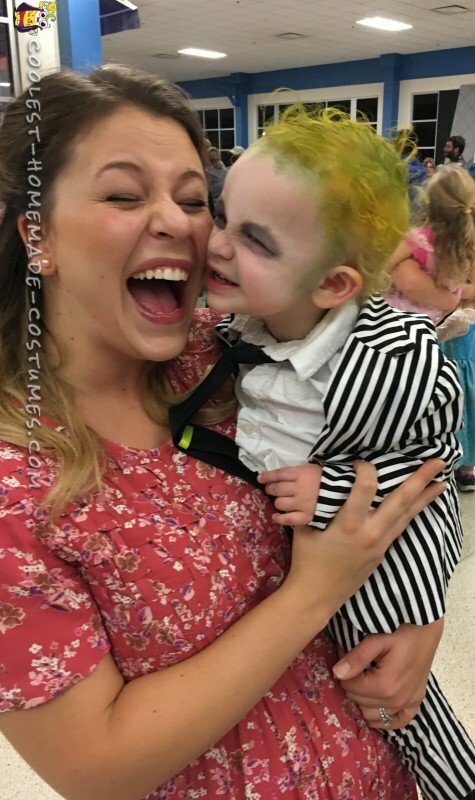 He loved looking at how spooky he looked in the mirror! 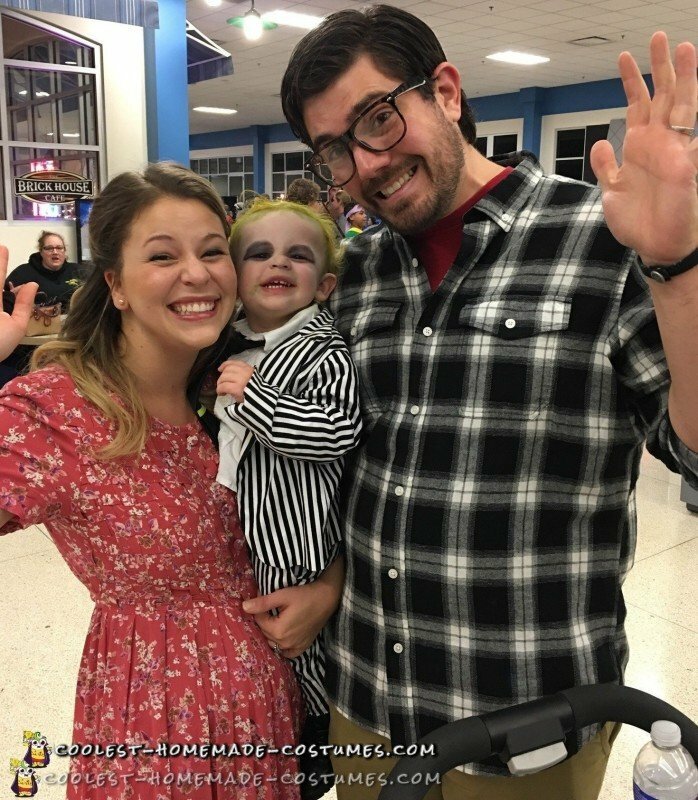 When we went to our Halloween event, it was so wonderful to see people of all ages to stop, laugh, or reminisce with us about our costumes. It seemed we got stopped every 5 minutes to get our photo taken or to talk about my son’s costume. He was sure to ham it up and ran around growling and saying “juice”! He was just the best. Both mine and my husband’s outfits required no purchase of any kind. I had the “play” glasses from years past. 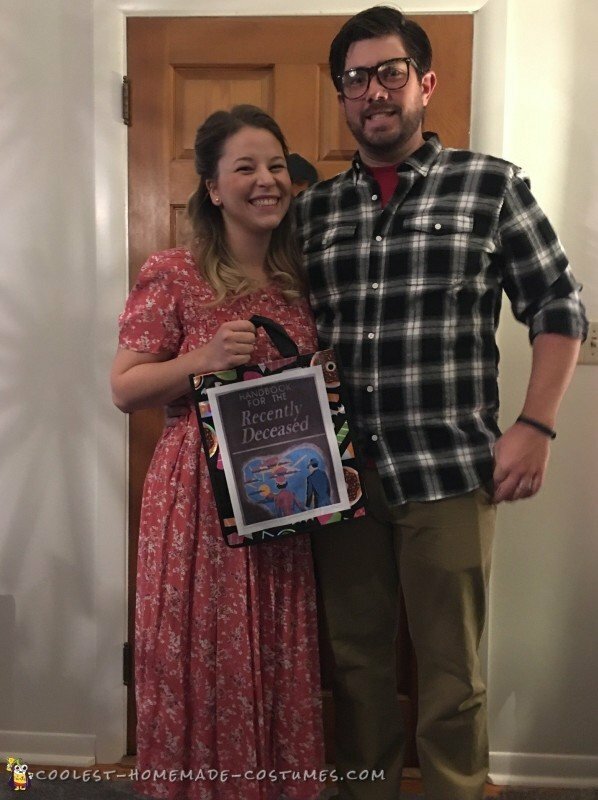 The book of the dead was a print out and just taped to a trick or treat bag! I loved that touch. We had an amazing memorable night, and our costumes were so worth it. It wasn’t too hard to do and was a statement piece for sure! We put all our hearts into every Halloween, but this one was surely special. Thanks for taking the time to read our little story! Happy Halloween!